Why Is Nespresso Pixie More Expensive Than Inissia? Which One Is Worth The Money? Dolce Gusto Genio vs Esperta, What’s The Difference Between Them? 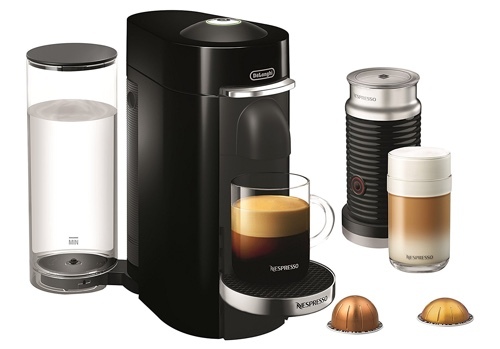 Review of Nespresso Creatista Plus by Breville – Should You Buy It? How Is The Nespresso Creatista Plus Different From Other Nespresso Machines? What Kind of Capsules Does Nespresso Creatista Plus Use? Can I Make Regular Coffee with the Nespresso Creatista? Creatista vs. Creatista PLUS vs. Lattissima Pro, What’s The Difference Between Them? Creatista vs. Nespresso Vertuo, What’s The Difference? Should You Buy the Nespresso Creatista? The Nespresso Creatista Plus is an impressive piece of design that combines the luxury and convenience of Nespresso’s system with the brilliance of Breville’s design. Nespresso has always been known to create espresso makers that make you your favorite coffee beverages with a touch of a button. And Breville is well-know for its top of the line, Barista level espresso makers (like Barista Express and Breville Oracle Dual Boiler ) which give you full control over the creation of your drink. This is the one thing you couldn’t do with a Nespresso machine, as it’s a fully automatic espresso maker, you couldn’t control the temperature of the milk or the espresso, and since it used an electric milk frother, the milk foam wasn’t texturized, so you couldn’t do art latte like you would with texturized steamed milk. All of this has changed with the Creatista Plus, it is the first truly Barista-style espresso maker by Nespresso that gives you full control over your drink. Single-serve espresso maker that uses Nespresso OriginalLine capsules. Fully automatic brewing and milk steaming. Choose from 7 pre-set and re-programmable drinks: Espresso, Lungo, Cappuccino, Latte, Macchiato, Ristretto and Flat White. Choose from 8 different adjustable milk textures for drinks like Cappuccino, Latte or Flat White. Choose from 11 adjustable milk temperatures. Milk is steamed and has ‘micro-foam’, which allows you to create latte art. Cool to touch steam wand with auto purge for cleaning. Color display allows you to easily choose and customize your drink with step by step directions. Using the colored screen on top of the Creatista, you can choose your drink, milk texture, coffee volume, and choose temperature of the milk. You’re customizing everything in your coffee drink. Place the included stainless steel milk jug under the frothing wand. The Creatista features a temperature sensor for the milk, which is how it knows it reached your desired milk temperature. After the brewing and milk steaming is done, it’s your turn to put together the espresso and milk. Latte art will require some practice on your part, and it will certainly be a fun thing to do! 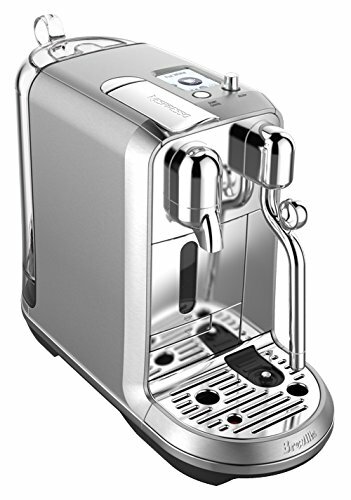 The Creatista Plus is an OriginalLine Nesprsso machine, so it can use any of the OriginalLine Nespresso capsules and Nespresso-compatible capsules. 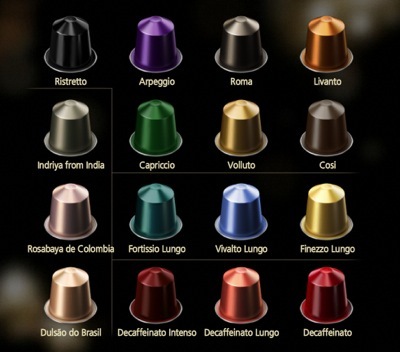 You can check out our best picks for the best Nespresso capsules for Lattes here. No, the Nesprseso Creatista doesn’t make a regular cup of coffee. However, you can always make an Americano, which is a shot of Espresso with added hot water to dilute it, and it results in a coffee-like drink. If you want a Nespresso machine that makes coffee, then check out the Nespresso Vertuoline or Evoluo. We have a detailed post answering this particular question. Click here to read the answer. VertuoPlus pictured above is one of Nespresso’s Vertuo machines. Vertuo can make espresso and coffee using especially designed capsules for Vertuo machines. Vertuo can make espresso and coffee in different sizes, you can also make cappuccinos, lattes and more using the Aeroccino milk frother which makes pretty much a standard froth of milk. You can learn more about VertuoPlus here. Creatista is one of Nespresso’s OriginalLine machines. It’s an espresso machine that’s compatible with all Nespresso OriginalLine capsules. What sets it apart is the professional frother that it’s equipped with. It’s not a frother that merely whisks milk, Creatista’s frother is a steam wand similar to professional espresso machine’s. The micro foam it produces allows you to do and practice real latte art. This is in addition to its beautiful touch screen, customization and all the great features we mentioned above. The Creatista is one of Nespresso’s high-end espresso machines, it comes with a price tag higher than the average Nespresso makers, which might make you wonder, is it really worth it? With its premium materials and customization options, the Nespresso Creatista is up there with espresso makers like the Breville Barista Express. It gives you drinks that are as customizable as you’d get from a semi-automatic espresso maker, and the fact that you finally get the option to professionally steam (and just froth up) milk, as well as choose the texture and temperature, and it’s all done automatically for you (no room for error here, your milk will be perfect every time), all of these new features makes it absolutely worth the price. However, if all of these options aren’t important to you, then you can still enjoy quality coffee drinks using an entry-level Nespresso maker like the Inissia or a mid-range like the CitiZ.